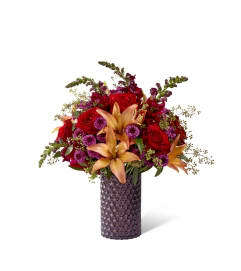 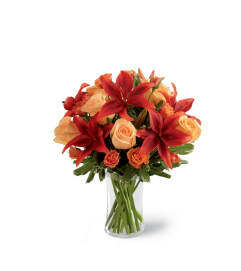 The FTD® Harvest Memories™ Bouquet brings the stunning color and fresh beauty of the fall season straight into your special recipient's home! A truly gorgeous fresh flower arrangement, this bouquet is brought together by an FTD® floral artist, showcasing rich red roses, orange spray roses, orange roses, orange gerbera daisies, orange Asiatic Lilies, red hypericum berries, and an assortment of lush greens. 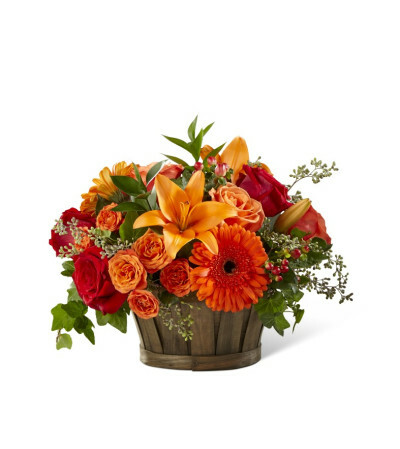 Presented in a rustic dark wooden basket to create an arrangement ready to be used as a centerpiece or decorate a countertop or console table, this fresh flower bouquet is a beautiful and thoughtful thank you, hostess, or Thanksgiving Day gift.